About two years back I enrolled for Aadhaar. I never received that, but I did not bother checking, since in those days Aadhaar was mostly like a passing fad. Well, now it is different. We have probably three more months of grace period before this abomination kicks in. I went to ICICI bank with my e-Aadhaar print out, but they refused to accept that, citing company directive to accept only physical cards. This was done to prevent fraud. I contacted Aadhaar “Customer Care” to request for a duplicate physical card, but was informed that there is no such provision! In fact they have been informed that e-Aadhaar should be accepted in lieu of Aadhaar card. I let the issue rest for sometime. After reading about the LPG deadline again in the newspapers I shook myself up, and started finding alternative ways to get in touch with ICICI. During my hunt I ended up with the email id of the CEO. I mailed to her my plight and requested her to invent an alternative process for people like us. After all, if the aim is to prevent fraud then there should be other ways too. Also they are our banker who already know so much about us to form an informed likely-hood of fraudulent stunts we may try. I was pleasantly surprised to hear back from a Senior Manager within one business day. She assured me they will address this. On the second day I got a call from my bank Branch Manager that a new process has been sanctioned and I need to bring my Aadhaar Enrollment slip with me. Yeeaah! The Manager used the Enrollment slip to download my e-Aadhaar from uidai.gov.in directly onto his system. Some form fillings and photocopies of an Id proof and I was done. So, if you have an account in ICICI then you can use the above process. You might want to directly check with the Branch Manager if the bank employees insist that original Aadhaar card is a must and there is no other way. They may not be informed. This process came into effect on 21st May, 2013. If you have account in other banks and they do not yet have such a provision then you might want to communicate with the bank senior management. I was informed by a reliable source that the banks received a circular in March of this year from Govt., that e-Aadhaar should be accepted in lieu of original Aadhaar card. BTW, for your information I will reiterate that – there is no way as of now to request for duplicate Aadhaar card. Anyway, happy enrolling your Aadhaar. BTW do not forget to take your mobile phone too since you will receive your OTP on your registered phone when then bank employee tries to download your e-Aadhaar. 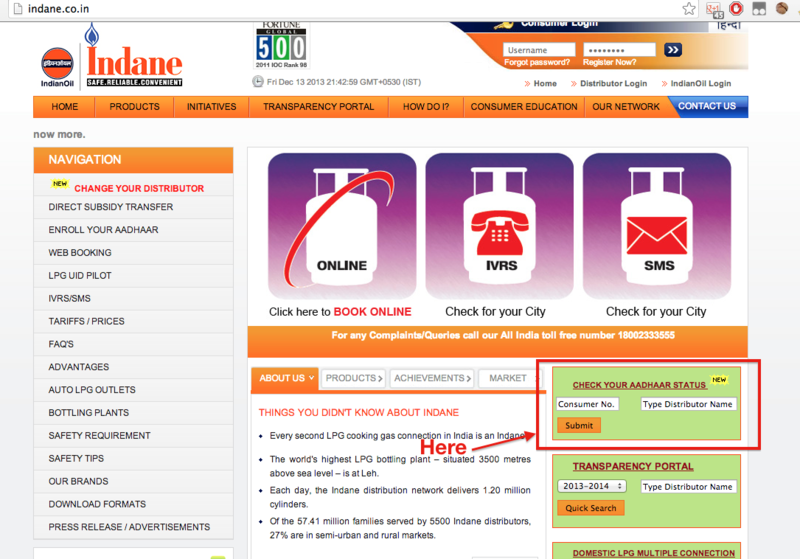 Update 26-Aug-2013 I am an Indane LPG customer and when I checked my Aadhaar status on their site, it showed Red for LPG and White (Invalid/Unkown) for Bank. I seeded my LPG information online from https://rasf.uidai.gov.in. Also I created an account on Indane and there they again ask for the Aadhaar details, which I provided. Update 2-Sep-2013 Now Indane site shows Green for LPG side and Bank side is Red! I already seeded by Aadhaar with bank in May. I followed up with ICICI customer care and got it confirmed that they have my correct Aadhaar number. They suggested, I check with the Gas agency, since enrolling online may not be same as enrolling offline. Update 6-Sep-2013 Went to my Gas agency. According to them my Aadhaar is already enrolled. So, it seems enrolling online is enough. Now I am stuck again. My guess is that the Indane software checks the status in its own database. Maybe it sycns the Bank linkage details on monthly basis for accounts with valid LPG linkage. I will now wait till the end of this month. If it becomes Green till then, fine, else I will have to pay a visit to my bank. Update 18-Sep-2013 Finally! Now Indane site shows that both IOCL and bank are linked. It is showing green for both now. I have been checking almost regularly, so it took around 15 days to refresh. Update 10-Oct-2013 I received my first DBT (Direct Bank Transfer) subsidy! The subsidy was credited one day before I received SMS from Indane that cash memo has been generated. However, the amount is Rs.435 only. This time they charged Rs.1096 (plus Rs.20 extortion by delivery boy) so the net cylinder refill price comes to Rs.661! That is damn costly. Few months back it was less than Rs.500. PS. The subsidy from Indane was credited by the name ‘APBS_IOC R_07-10-2013’, so look for similar name in your bank statement. Update 18-Dec-2014 Today I finally received my Aadhaar card! That is, I received it after around 3.5+ years later!!! Kudos to Indian bureaucracy, they do get things done, even though it may not matter by then. Many thanks. it worked for me. How to check if aadhaar has been linked to the bank account ? I had given request to ICICI bank to link my aadhar 2 weeks back. I do not see any option in the ICICI bank website to check my aadhar number. Also in the Indane LPG website, it still shows that My aadhaar is not linked with any bank account. How much time does this take to get these linked? Well I don’t know. I guess you can check with your bank’s branch. Well, I have register my Aadhar card with one of the Aadhar branch and found a message from Aadhar service about my Aadhar card is online and i can download. for your reference here i am sharing the online link, you can searc over there hope this will help you! However same is not updated with NPCI and I do not get LPG subsidy. I have also updated Adhaar card no. and bank details with IOCL. Thats why i say icici is best. I have experienced twice, once my account went dormant and second time there was a credit card fraud of 35k. Want to have good sharing with u. Very informative…especially the updates…keep it up..!! Hey Nirupam! I need to do exactly this soon – aadhaar + bank (I’ve also planned ICICI) + indane. Kudos for your success with ICICI management. And thanks for the updates. It’s definitely going to help me! My problem is that by mistake I have linked my adhaar card with ICICI & Union Bank also, My LPG subsidy comes regular in my ICICI bank but I wish that my subsidy should come in Union bank, If I close ICICI bank account then can it will be direct come in my Union Bank A/c coz I have linked adhaar card with union also. please reply any body. Sorry no idea. I guess try it and find it out for yourself. Or maybe u could try unlinking your Aadhaar from ICICI first, and then see what happens. Thank you! Posts like this make the internet a great place. All the details of what one would have thought a simple task, but obviously want’s, clearly laid out and provide benchmark and perspectives. Awesome job. Hi guys,Thank you all for the vital information and navigation to the website to check the status but I do have a query.I am told by the distributor on 10 jan 2014 that I will not get any subsidy on my LPG as it is my 10 th cylinder and their will not be any subsidy on 10th one .it is only for 9 cylinders and I will have to wait till April 2014 to get subsidy on LPG till then for two months I will have to pay the market price.Please tell me is it true?I have submitted my adhaar to my bank and distributor already.Anyone can answer this pls? That is WordPress’s service. Not really in my control. The email should have Unsubscribe link. i had linked my bank account last year with one bank. now i want to change the bank account as my account is not active. how to change the bank account? No idea sir. Please check with your bank and state your use case. Have already updated my Bank A/C details with Aadhaar No. & as a result a confirmation SMS was also sent on my Registered Mobile No. but when I checked with the IOCL Transparency Portal,the Bank A/C Linkage status shows RED & my account is with SBI. What should I be doing now? IOCL Transparency portal is not updted regularly. U should check it now, as already one month passed. Good Luck. I am from tamilnadu, now it is getting mandatory for us to link adhar / bank ac / indane by Jan 1 , me being icici a/c holder this blog was very informative , thanks to all . My icici ac is a joint account with my wife , will there be a problem of getting govt subsidy to this a/c . Once I had similar problem with pf , they refused to accept my icici a/c as it was joint account , please suggest ….. I am not sure, but there shouldn’t be a problem if you are the primary account holder. Login to your ICICI Bank account online banking. Follow Below steps. Vallah…It will be one in 5 working days…!! I have a HDFC bank account. You dont need Aadhar card to get LPG subsidy. Just link your LPG ID and consumer no to bank account online and go to MyLPG.in website and login as per your LPG distributor. In Get Subsidy section fill the form details (only two id proofs reqd. aadhar is optional), you will get filled form in pdf format in email id you have provided. print it and submit it to your gas agency. thats it. you will get subsidy in your account without aadhar. i am not able to understand why the online facility by banks is not given to customers where they fill there adhar details and upload their adhar document. it will reduce bank work also. I have also face the same problem as original author that I have the e-aadhar but dont have the printed copy of it. ICIC bank person refused to accept e-aadhar (date 03/01/2015). After lot of reasoning I was able to provide the printout of e-aadhar and they accepted it for updation. The problem doesn’t end there. I have registered aadhar with the link but the got an rejection sms after 24 hour mentioning that address in aadhar and gas agenecy doesn’t match which never will. SBI provide link to register LPG ID (17 digit, which I get now on sms on regualr basis) but somehow so advanced ICICI doesn’t. If somebody knows such option, please let me know. So it seems there is no way out of this loop. Finally I called up the gas delivery boy. He said “different address wala aadhar bhi chalta hai sir, aap to ek photo copy aadhar ki, passbook ki first page ki copy, any previous delivery slip aur bank ka cancelled cheque de dena” baki sab link ho jayega…. hamare paas jo form abhi naye aaye hain umain dusre address ka aadhar bhi chalta hai” …. 🙂 I got so relieved hearing that and I hope this brute-force Indian method should actually work. I will post if that also doesn’t work. Hey, While writing I got the answer of my question… You can add LPG ID and AADHAR Card by yourself in ICICI Bank by going into following link after logging in. No need to link aaddhar card if you have connected LPG ID to your bank account. Hi Guys It’c very easy to update. its ask for account no-aadhar no and registered mob no..
need also ATM secure authorization. Very good information provided. Thanks for the information. Also visit the page to get other information on this topic. According to them you cannot, since e-Aadhaar should be treated as equivalent for physical Aadhar card. However, if you make any correction to your Aadhar details, like changing address then they will send a new Aadhar card.